An in depth Review of the X115 New Generation “SOS Total Youth” Cream for Women from Jarmy SRL in Italy. When I was recently contacted by Jarmy I jumped at the chance to review a product that is created outside of the United Kingdom. The company is a leading name in Italy and has the appropriate slogan “Beauty For Life”. The product I have been sent to test is a 15ml bottle of their Women Anti-Aging Cream. Said to bring back the skins youthful appearance by increasing hydration and collagen in the skin. The small bottle is designed to last anything from four to six weeks, so I wanted to test the product accordingly before reporting my findings. The first thing that I noticed when I began testing this product was that it had no smell, only a light plastic sort of smell and a slight oily scent, I take it that was from being encased in its packaging. However once applied there was no lingering smell. The cream was very light to apply and with a few strokes it soaked into my skin with ease. Even though I have sensitive skin I have had no issues with using this product whatsoever. 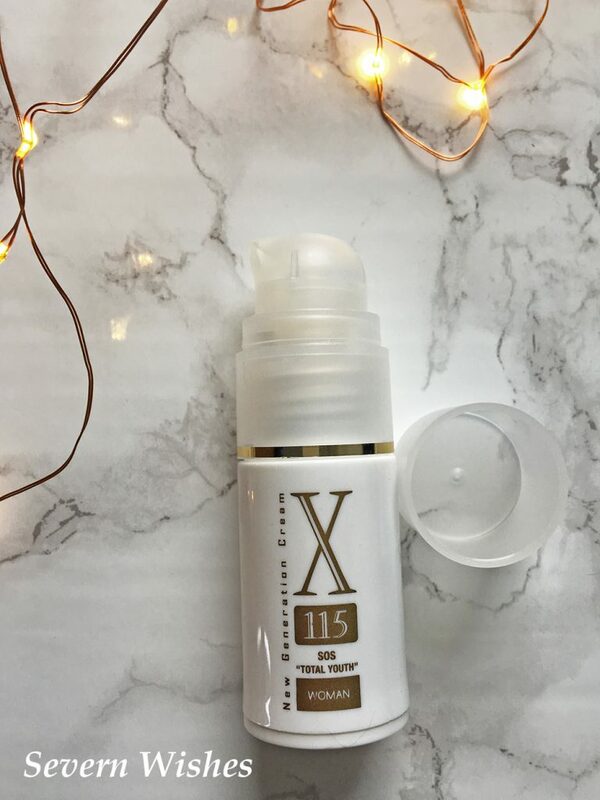 The X115 Anti-Aging Cream contains lots of naturally occurring ingredients including Argan Oil, Acai Oil, Shea Butter, Avocado, Cholesterol, Vitamin C, Vitamin E, Vitamin E Acetate, Lipoic Acid and Vitamin A. There are some specific reasons why the following ingredients are used in this cream. I will now briefly outline why some of them are so relevant to its effectiveness. Vitamin E – provides an anti-oxident action by blocking radical reactions. Vitamin A – improves skins thickness and promotes collagen production. Lipoic Acid – helps protect cell membranes and protects skin from early aging. Not only that but it is both Hypoallergenic and is Dermatologically tested. Due to it also being Paraben, Gluten and Fragrance Free, all of these things help prevent any skin irritations. I could tell after a week of using the cream that my skin liked it. There are a couple of other ingredients that people should be aware of before making a decision to purchase. This cream does contain a muscle relaxant and a type of acid that can cause a tingling sensation in some people. Gamma-Aminobutyric Acid (GABA) – this ingredient has an inhibiting action upon nerve pulse transmissions, it promotes the reduction in expression lines. Acetyl Hexapeptide-8 – this ingredient is a micro muscle relaxant that provides a smoothing action to the areas of the skin it is applied, it has been known to contribute to the reduction of facial wrinkles. I honestly had no problems with the cream, and read all through the accompanying leaflet before first applying it. As I stated earlier with my somewhat sensitive skin I was expecting something, but no, and I have to say I have noticed a slight difference in the quality of my skin. The X115 is designed to be applied at either the morning routine or the evening one, whichever suits the customer better. I have always preferred to do my more complex routine just before going to bed, that is because I usually struggle to remember to apply everything in a morning when I’m still half asleep! So how and where can you apply this X115 cream. Well the first thing you must do is make sure your skin is washed thoroughly and then cleansed. I love using my Garnier Micellar Water to clean my face and neck before bed, it is refreshing as well in the warmer months of the year. Make sure you pat your skin dry, before applying the cream. Jarmy recommend the cream be directly placed on to skin where there are already lines and wrinkles, such as the forehead, around the eyes etc. You only need apply it in small quantities, then with a gentle circular motion rub it in gently until it is fully absorbed. It is recommended that you keep your face relaxed until the cream has fully sunk in. This cream is not an SPF, so if you are applying it with a morning routine, you must wait several minutes after it has been absorbed, before applying your regular SPF face creams and then any makeup after that. Ensuring that your skin is thoroughly protected from UV Rays will allow the product to work more effectively. Over all I have found the cream easy to use, and because the bottle is so small it’s easily portable too. I went away for a weekend and just tossed it in my bag with my makeup. The small bottle went a very long way, with an evening routine I have used it consistently for almost six weeks now, with a very small amount remaining. The bottle has a pump action top, and one squeeze of product onto a finger was enough to do the problem areas on my entire face. This is roughly a large pea sized amount, and honestly this will be all you need. Use the cream sparingly, it isn’t oily at all and is quite thick, but it will absorb quickly if you massage it into your skin gently. The X115 states that it will act on several levels to ensure that your skin becomes more youthful. It does this by targeting several main areas and skin aging problems. They are; Protect, Nourish, Regenerate, Smooth and Correct issues. 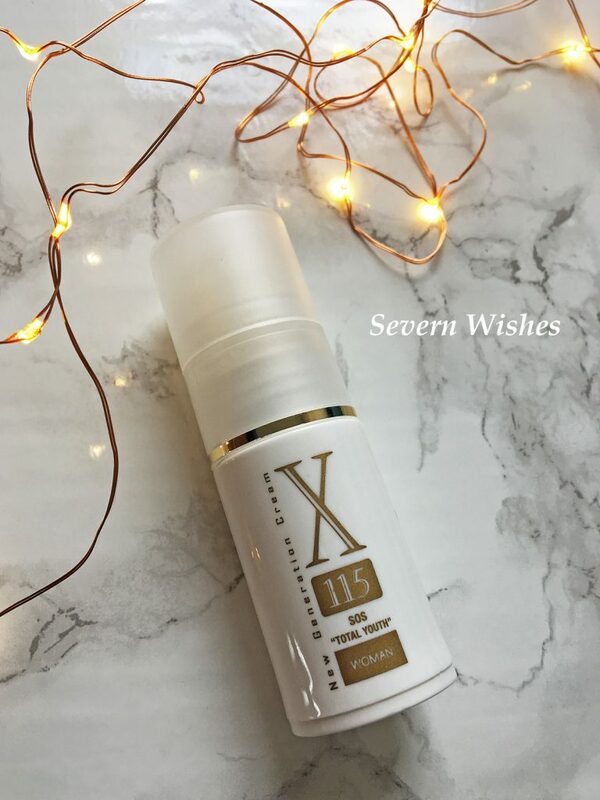 The main problems that women around my age have with their skin are that it is Tired, Stressed, Dry, Sagging, Dehydrated and Wrinkled, but X115 is going to help with all of them in one tiny bottle. I must admit that I am lucky enough not to look my age, yet! But all the same, using X115 for these past few weeks I have noticed some changes in my skin. The lines that appear on my forehead with certain facial expressions are less noticeable and my skin is definitely better hydrated. (As someone who regularly has dry skin I do drink between 1.5 and 3 litres of water a day though as well and this helps your skin stay hydrated). My face is softer to touch since using this cream and my crows feet are not as prominent as they were three months ago. I don’t really believe in a ‘before’ and ‘after’ image, because your skin is made up of so many factors, like diet, exercise and hormones. But I have definitely noticed a difference in my facial areas, so much so that I stopped using two other creams a month ago, just so that I was focusing all my attention on the X115. I wanted to see what it could do and see if it could do, in a shorter time period, what my usual products had been attempting to do for months. I would like to finish my review on a positive note. I am rather glad that Jarmy got in touch with me to review their Anti-Aging Cream. I am currently twenty nine years old, I work full time and blog part time, and I have stress in my life like everyone else does. But looking at my skin now, compared to three months ago, I can see it doesn’t look as stressed and looks healthier. I hope that it was this cream, I definitely haven’t given up my food luxuries like chocolate, so I know it can’t be that! If you’re interested in knowing more about the incredible products available from Italy, you have two choices. Visit the website and click on the United Kingdom flag to read all about it in English, or you can pop over on to Amazon, where the products can also be purchased from, direct from Jarmy still though. I will leave the links to both of these at the end of my post if you want to take a look. 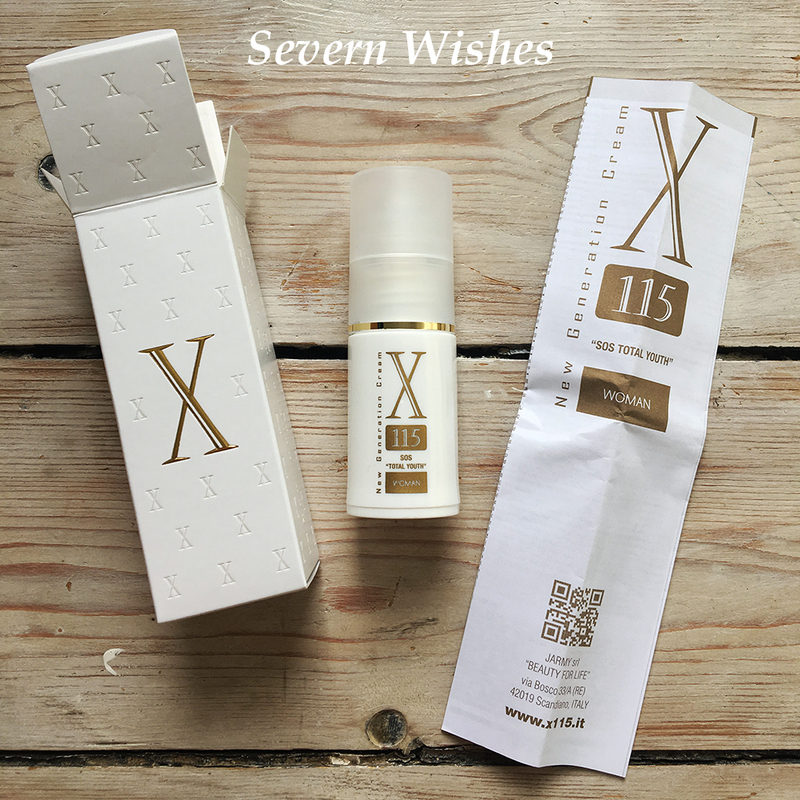 Thank you for reading this beauty and skin blog post today, I hope that you have enjoyed reading about this interesting X115 Anti-Aging Cream, I know it has been a pleasure testing it for you all to read about. This is an affordable, but high quality product, and I would like to thank Jarmy for choosing me to represent their brand this summer by means of this testing and review.